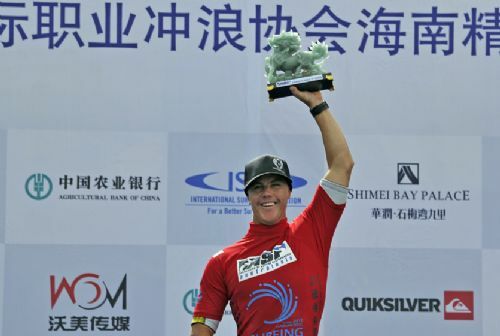 Irish surfer Glenn Hall claimed the title of ASP Hainan Classic Heats that ended on Saturday in Wanning city of China’s Hainan Province. Hall came first with 16.33 points, followed by South African surfer Royden Bryson with 16.16. The third and fourth went to Australian Dion Atkinson and Frenchman Marc Lacomare. On the Final Day, wave conditions decreased slightly at Riyue Bay in Wanning, but remained contestable in the 2 to 4-foot-range with light offshore winds. Grey clouds were lingering over the event site. During the final competition, Hall made many pretty turns with 180 degrees in surfing and Bryson also gave a good performance, both winning the applause from surfing lovers and spectators. Hall said that Wanning had a good wave condition and he would introduce the surfing resources to the world. "I feel a little disappointed to get the second," Bryson said.